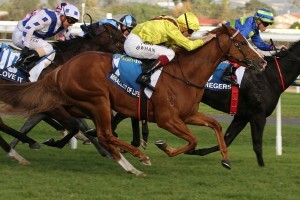 The Euclase Stakes is a Group 2 event run at Morphettville Racecourse on Robert Sangster Stakes Day on a Saturday in early May during the Adelaide Autumn Racing Carnival and is named in honour of the race’s 1991 winner Euclase. The meeting is headlined by two elite level features with the fillies and mares facing off in the Group 1 Robert Sangster Stakes (1200m) and the three-year-old staying fillies running in the Group 1 Australasian Oaks (2000m). Offering $500,000 in total prize money, the set weights Euclase Stakes is run over 1200m and is open only to three-year-olds. The best three-year-olds out of the Euclase Stakes often back-up at Morphettville a fortnight later in the Group 1 The Goodwood (1200m), but their strike rate in the latter feature is poor. The latest edition of the Euclase Stakes takes place on Saturday May 4, 2019 . The official Euclase Stakes Results 2019 and Finishing Order will be available right here once the race takes place on Saturday May 4, 2019 . Euclase Stakes betting opens soon after the release of the final field the week of the race and is dominated by in-form local three-year-olds. Runners with proven form at the track and distance usually dominate the Euclase Stakes odds. Well performing graduates from lead-up races during the Adelaide Autumn Racing Carnival like the Listed Manihi Classic (1050m) and Listed Redelva Stakes (1050m) are also usually shorter in markets for the Group 2. In 2014 Miracles Of Life ran second in both the Manihi and Redelva before her Euclase Stakes win. With an increase in prize money to half-a-million-dollars, the quality of Euclase Stakes runners has increased and many interstate raiders now make the trip to Adelaide and feature high-up the markets on the Group 2 sprint. One of the biggest upsets in the race’s history saw the filly I’ll Have A Bit salute in 2018 at Euclase Stakes odds of $151! The latest Euclase Stakes 2019 odds will be available below once the Adelaide Racing Carnival markets on the three-years-old feature are announced the week of the race. The Euclase Stakes field attracts mainly local three-year-olds that have been racing well over the previous weeks in South Australia. On occasion interstate runners make the trip for the Group 2 sprint and in recent years a number of visitors including Nicoscene (2015) and Sweet Sherry (2017) have been successful in beating home the locals. The Euclase Stakes nominations close the Monday before the race runs on the Saturday with the final field and barrier draw released on the Wednesday. Miracles Of Life (2014) is one of the most notable recent Euclase Stakes winners as she went on to win the following year’s Robert Sangster Stakes in Morphettville also. Photo Credit: Jenny Barnes. The official Euclase Stakes 2019 Final Field & Barrier Draw has been announced as of on Wednesday May 2, 2018 and detailed in full below so stay tuned to see what three-year-olds make the final line-up for the $500,000 race. The Euclase Stakes form guide features all the information punters need to know before placing a bet like the barriers, jockeys, trainers and lead-up runs of the three-year-olds in the field. Looking for runners coming off a top three finish, proven Morphettville performers and other Black-Type placegetters are all crucial when doing the Euclase Stakes form. Interstate-trained three-year-olds down in grade off a Group 1 autumn run is another key factor to look for on the Euclase Stakes form guide. A link to our comprehensive Euclase Stakes 2019 Form Guide will be provided for punters below the week of the race. Euclase Stakes tips include looking for three-year-old sprinters coming off a top three finish over the same 1200m distance last time out and those with proven ability at the Morphettville track. Faatinah (2016), Nicoscene (2015), Miracles Of Life (2014), Lonhspresso (2013) and Go The Knuckle (2012) are all recent Euclase Stakes winners that finished in the money in their lead-up runs. When the full field is released, keep these points in mind. Our Ladbrokes’ insider Euclase Stakes 2019 betting tips and Adelaide autumn racing selections will be detailed below the week of the race so stay tuned for the youngsters to back and sack in your Morphettville tips this season. Euclase Stakes results in recent years show an even mix of local and interstate winners. Notable Euclase Stakes winners include Miracles Of Life (2014), Lonhspresso (2013), Show No Emotion (1998) and Sword (1995).